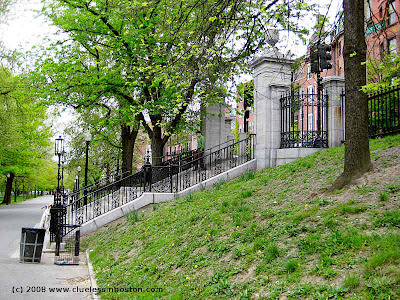 Stairway in the Boston Common. The guy is even wearing a green shirt,to match!!! A good shot at the right time. I missed yesterday's door. I tend to take photos of doors and doorways a lot. They are so interesting, don't you think? Neat! Wish I was there, it is so lovely! Love all that iron fencing. So much green too! It is a lovely crisp image. Is Boston as clean as it lokks or is it where and how you take the image. It just such a litter free place, with wonderful architecture. Nice to have something in common with our fellow bloggers!